These lenses are very clear, with no tint in the lenses, and are the best option for most people. This is the absolute best clear, AR Coated blue block lens we have seen, as it offers the clearest vision without color distortion, and the highest UV/Blue Light/HEV protection. Filters 100% of direct UV rays. Extremely clear vision without color distortion. 1.6 high index material is 15% thinner than poly and 30% thinner than CR39 plastic. Scratch resistant and easy-to clean. Blue light reflecting AR coating on the front. Regular AR coating on the back so blue light does not reflect back into your eyes. 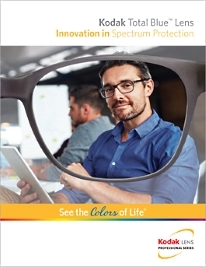 Offers clear, natural vision with no color distortion. Reduces squinting caused by bright outdoor light. Helps with object recognition in low-light and night-driving conditions. The Kodak Total Blue 1.6AR lenses are available in all of our full frame styles. These 1.6 high index lenses are very thin and are not available in rimless or semi-rimless frame styles. The option price for these is $80.00. They are available as reading lenses or prescription lenses for reading, computer or distance vision. Read more about all of our blue block AR lenses. If your prescription falls outside these parameters we can help! Contact us! "Excellent for eye strain/fatigue and blocking out excess blue light." -Matt H.